Make Massive Savings In Both Space And The Cost Of Your Pallet Stack. No Import / Export Restrictions To USA Canada Or Many Other Countries, As With Wooden Pallets. Pallet Stak is specifically designed for use with both fork lifts & pallet trucks. Alleviates manual handling problems and speeds up the movement of all sizes of loads. Able to handle loads of up to 500kg or greater where additional Protean Pallet Staks are utilised. Easy to attach and adjust to an extremely wide variety of consignment sizes. High-density polyethylene Protean Pallets strong and exceptionally light at just 400grams per unit. They are also weather proof and ideal for protecting the underside of cardboard cartons or other items you wish to elevate above floor level. 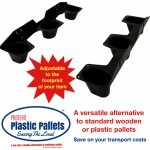 Protean Plastic Pallets are environmentally friendly as they are infinitely re-usable or recyclable. Protean Plastic Pallets' compact design means that a one full pallet delivery to you (320 pieces - equivalent to 160 traditional pallets takes up only 0.8sq meters of your storage space and measures only 1.45meters in height. Compared to a height of over 20meters for conventional pallets. Protean also provides an ideal option for weight critical consignments e.g. airfreight or any other transport chargeable by weight. Wooden pallets are of course subject to restrictions in many countries including the USA, and are not able to be exported to those countries as part of your consignment. Protean provides an excellent solution to these restrictions.